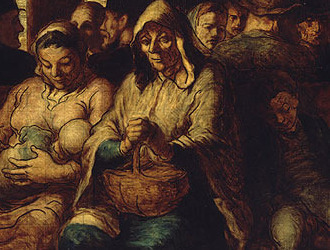 The Third-Class Carriage demonstrates Daumier's renowned sympathy for the poor. Although a bitter caricaturist of the bourgeoisie and politicians, Daumier drops the satire and draws a sensitive picture of the poor. A family sits together in the third class car, folded in on themselves, isolated and absorbed in thought. Daumier intended to capture the plight of the working-class not through drama but through the quiet moments of their everyday lives. One sees the hardness of their lives through their clothes, the weariness of their posture and their facial features, particularly the grandmother as she confronts the viewer head-on. The background takes up more space than the foreground and is highly detailed. From what little one can see of their dress, it is presumed that those in the background are of a higher class station. They talk animatedly amongst themselves and a few are turned toward the direction of the third-class passengers but no one engages them directly. The family of four sits in the opposite direction, which emphasizes their isolation from the rest of the travelers. There is also a comparative stillness in their movements, which most scholars have interpreted as tiredness. There is a window in the foreground and although the light reaches the family, one can interpret that they are far from the window, and therefore, possibilities. The fact that there is a partially covered-up window far away from them also makes them appear much more isolated. The choice of the four family members is very revealing: there is only one male figure. He is young and thus it is presumed that the older male figures who would have been in the family's lives are either dead or have left them - leaving the women are on their own. 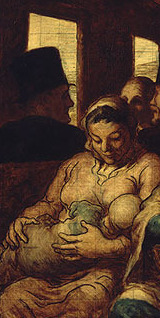 The grandmother sits next to a nursing mother, which suggests a completion of the life cycle. For such a crowded background, the family on the bench seems to exist in its own quiet space, which is helped by the seating left open next to the boy towards the lower-right hand corner. There is also a little bit of empty bench on the left by the mother's side. The family figures are drawn in larger proportion than their distance from the rest of the passengers would warrant, which gives them a more commanding presence. The upper-third of the painting is left blank, which suggests a space that is cavernous when it comes to height, but very cramped when it comes to length. The windows towards the upper-third left hand side of the painting provide a relief from the heaviness of the train car. This painting is unfinished, so Daumier's true intent cannot be known. 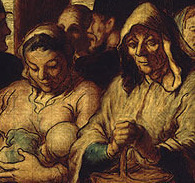 However, from the browns in the background and the various shades of brown, black and green that Daumier has used to start on the passengers clothes, one can assume that it is a somber color palette. The lighting provides a nice and unexpected contrast to the somber tones. The grandmother and mother are left unfinished. One wonders what the effect would be if the upper half of the mother and grandmother had been painted in. Because the painting is unfinished we have no way of knowing if it would have maintained its sunny character. The mood of the painting is one of transit itself. One is on the move but also resigned and waiting for something to happen, for example, they might be en route to a new job or to a friend's house. For the people in third-class carriage, what awaits them is less ideal than for most. As much as possible, Daumier uses economy of line to keep his drawings simple and powerful which is evident in the hands of the mother, for example. Although mere outlines, they are beautifully drawn.